Yep, I’m that person. The person who buys books for everyone on her holiday list. What to get Dad who returns nearly everything I buy him? Books. What to get my nephew whose Japanamation jargon resembles a foreign language? Books. And what to get my niece who, like me when I was a kid, aspires to be a writer? Why, blank books, of course. 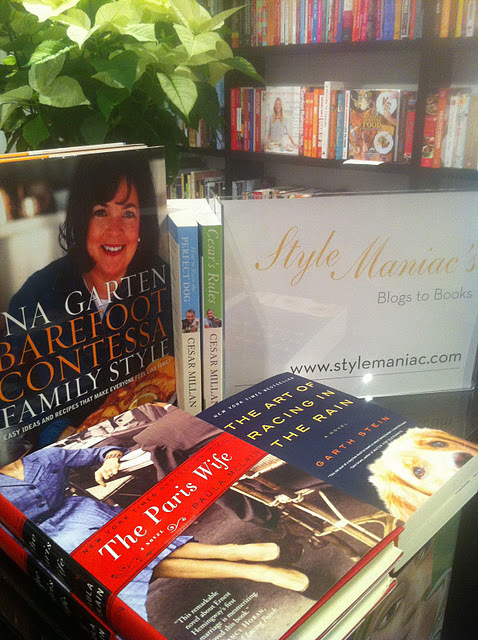 One of my favorite blogs, Style Maniac, recently teamed up with independent bookseller Books & Books of Westhampton Beach, NY, to launch a month-long celebration of the art of giving and receiving books. The Blogs to Books challenge invited readers to choose one book and one recipient to give it to, whether that person be a family member, friend, or stranger. The givers were then invited to share their experiences online, and Books & Books compiled an in-store display of favorite books chosen by bloggers who participated in the program. Blogs to Books display at Books & Books, Westhampton Beach. Image by Denise Berthiaume. Since I love to read, and love to support other writers, I took the challenge and gave a copy of the The Paris Wife, by Paula McLain, to my mom. The novel is about Ernest and Hadley Hemingway and the Lost Generation of writers and artists in 1920’s Paris. I thought my mom would enjoy it because she’s a very creative person and a long-time lover of art. When I was a kid, she volunteered in her free time to teach art appreciation at my school (we called her the “Picture Lady”). My Catholic grade school didn’t have the funds to pay someone to teach art history, so my mom took it upon herself. At the time, I thought it was super embarrassing when she would stand in front of the classroom and show us slides of Renaissance and Impressionist paintings on an overhead projector. She once even dressed up as Vincent VanGogh. Now, as a working mom myself, I know just how little free time she must have had in those days, so I am touched that she would spend it with my class to share her love and knowledge of art. Have you recently shared a book with a loved one? Will you be giving books as holiday gifts? If so, leave a comment and share. I’m always looking for titles to add to my ever-growing “to read” list. Books are the perfect gift. I work at a gift wrapping station and so many people bring me books to wrap. I haven’t bought any recently because I have so many that I still need to get through reading. How interesting – I never knew that Books & Books was from NY. I’m here in Miami where we used to live before moving to Madison and was just browsing the B & B in Coral Gables … what a lovely place their stores and cafes are. My dept. at UM actually did a lot of lectures there for the community. Is there a bookstore similar in Madison? Being a newbie, I am ashamed to say that I haven’t made it to a bookstore or the library even. This is a great little project Doreen has put together. Congrats on winning. I have purchased the Shel Silverstein collection for my newest grandson this Christmas. It will surely please his daddy! Susan – LOVE this! We started a new tradition this year of getting the boys books to give each other for gifts…and look forward to the day they are old enough to love browsing and carefully select a special book for the other! Susan, how incredibly wonderful of you to not only contribute a wonderful selection and story to Blogs To Books (the tribute to your mom really touched my heart) but then to feature this project on your blog as well. Thank you! As you can imagine, books are my favorite gift to give and receive. For me, it’s a gift that never expires and gives over and over again, as I often revisit my favorite titles. Next year, I’m hoping Blogs To Books will include books written by some of my favorite bloggers as well — meaning you of course! Thank you again and happy holidays. Love, love, love giving (and receiving) books for the holidays. Last week whipped through Anatomy of a Disappearance by Hisham Matar and am now sending copies for my mother and sister-in-law. A brilliantly written novel – every word seems perfectly placed.